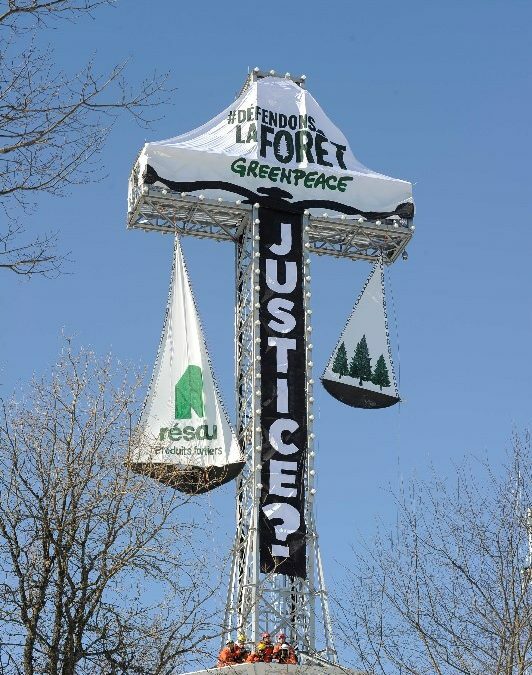 (Montreal) – Early this morning, 10 Greenpeace activists and volunteers transformed the iconic Mount Royal Cross into immense scales of justice representing the imbalance between the destructive practices of Canada’s largest logging company, Resolute Forest Products, and the defenseless Boreal Forest. In the Montagnes Blanches “Endangered Forest” in Quebec, Resolute is operating in First Nations’ traditional territory without consent. In both Quebec and Ontario, despite scientific recommendations, the company uses trees from the habitat of threatened woodland caribou herds. A growing number of major forest conservation organisations have suspended work with Resolute because of its unwillingness to do even the “minimum” required by science in terms of conservation. In January, due to these types of destructive practices, Resolute lost three of its Forest Stewardship Council (FSC) certificates, covering an area 127 times larger than the city of Toronto. The FSC is a key component of the marketing of the company’s pulp, paper and lumber products. For more information on the #StandForForests pledge that has attracted over 50,000 signatures within two months, visit www.standforforests.ca.